The Chinglish Files by olr: Agreed. Beautiful, indeed. 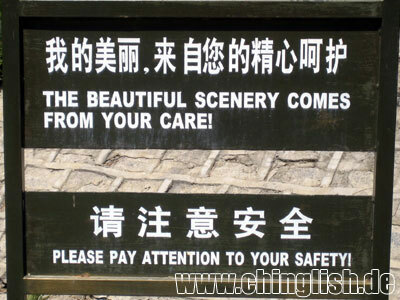 This is a good example of why Chinglish (that doesn't lead to dangerous consequences) needs to stay. In the West, we are so used to a certain approach with public warning signs or Do's and Don'ts that we don't notice them anymore (and, in the end, often end up doing things that these signs tell us not to do). But can you resist the charme of this approach, taken at the Great Wall? It's part of a series visible at countless other spots along it. What's the supposed correct translation then? Well，it is not too hard to understand. P.S. The annoucement of the Nanjing Metro always says :'Mind the gap between train and the platform when getting aboard'... I think it is odd. What do you think about that? So-so or Chinglish? It is so-so or a piece of Chinglish? Pls consider one option for Chinglish - they just dont care ... Chinese is the languae of the civilised woMan.